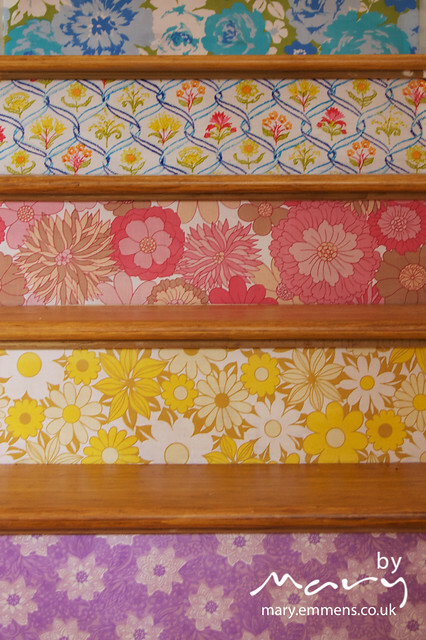 Are you staring at my stairs? A few weeks ago when we were beginning to settle in to the new bit of the house I decided that I had time and energy to execute a plan that had been swirling around in my head for a while. Due to the slope from the back of the house to the garden the house extension has included a set of stairs from the ‘old’ dining room to the new kitchen/diner. Tobit had laid the bamboo flooring in both areas and used it on the stairs too but still the risers needed something doing to them. Ensure that the area to be decorated is clean and dry. 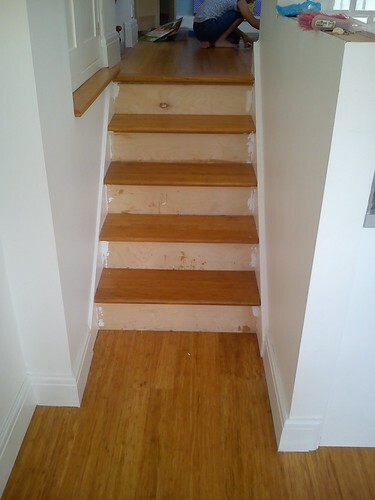 My surface was new wood, if the stairs are painted I would suggest that you need to remove the paint (but I am no expert). Measure the size of the area you want to cover and cut a piece of fabric that size. Mix some glue with a little water in a pot, just enough water to make it easy to paint on but not too much water that it will run/drip everywhere. Paint the glue over the area to be glued. Apply fabric to the area and smooth out any creases, lumps of bumps. Allow to dry. Once dry apply a coat or 2 of glue/water mix over the fabric area to seal and protect. There you go – job done. I think the hardest part was choosing which fabrics from my vintage sheet stash I should use. 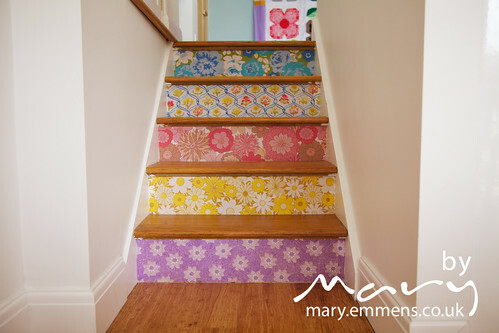 Thanks to Judith for her hints and tips after I’d read this post and to Karen for her inspiring stairs that I first saw a few years ago and have stayed in my mind ever since! If you have any questions please leave a comment below or if you decide to apply the same treatment to your stairs please let me know I’d love to see. And if you want some vintage sheet fabrics I can set up a custom listing in my etsy shop for you, just let me know measurements and the colours you would like. Those look so cheerful and colorful! We have two sets of stairs with risers that could use some work. I’d love to know how well these hold up over time…maybe a report back in a year? That’s inspired! Absolutely love it. They look amazing! Such a cool idea. Would work well for a side table or something too. Wow! These look amazing. I am not surprised you smile everytime you see them! STOP IT! They are absolutely incredible. You’ve made my morning. Gorgeous! I’d love to do the same. 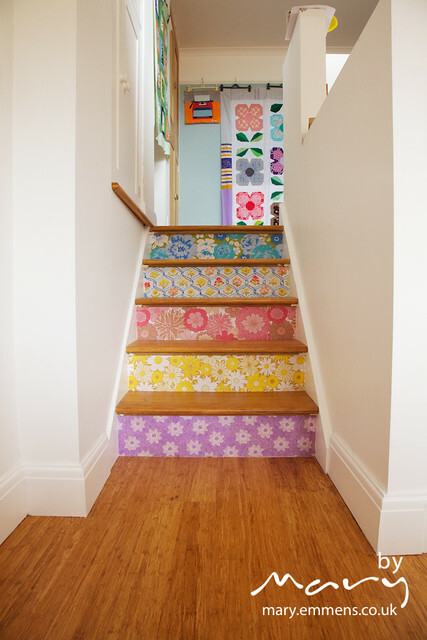 Only I have carpet on my stairs and er if I ripped it off the stairs are way beyond a bit of vintage sheet prettyfication. In fact I’ve got a feeling two steps were in such bad nick they were replaced with plywood! But that’s 18th Century properties for you! Gorgeous… they would make me smile too…. Absolutely priceless, unique and entirely you! Love it. Yes, I totally AM staring at your stairs! Oh I know that jealousy is a sin but, seriously, I can’t be good all day every day. I am properly jealous, and mainly because my husband and I naturally have to agree on all house décor and there’s no way he’d ever let me do this!! I’d smile every time I went up the stairs too. Those are happy stairs! wow! nice and very original! would it be hard to maintain though?